My brother-in-law Martin Plumeri and his wife Pat from California both decided to learn to play the electric guitar a few years ago, and this has since become a big part of their lives. Martin branched out into guitar building, mostly by using and modifying some of the kits that are available. These are mostly finished with painted surfaces but some of the wood that is used – mostly ash quite often has an attractive grain. He suggested that I might like to do a natural finish – perhaps with some metal inlays of the sort that I’ve used on my carvings. He was also keen that there should be an Australian theme. 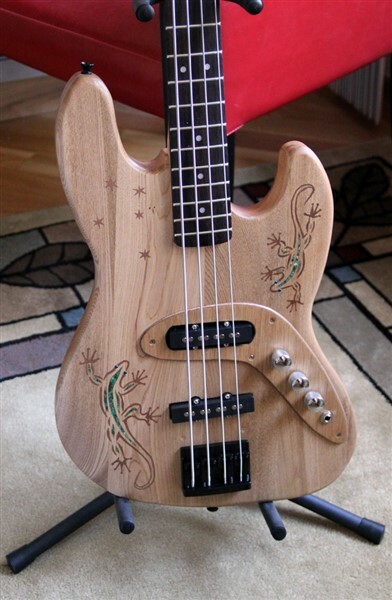 The jazz bass kit came from Pit Bull Guitars – a company in West Australia that has a wide range of kits and other materials for guitar makers. The wood of the body is laminated so we needed one that had well aligned grain, and Adam Boyle, the founder and proprietor of the company was kind enough to sort out one that was very nicely matched for us. For decoration I carved two geckos that are constant uninvited house guests here in Queensland and used copper and crushed malachite for the inlays. To place the geckos where they looked best we had to abandon the plastic finger guard and chrome electronic control panel. This exposed the wiring channels and other recesses so I used a thin plywood panel veneered with camphor laurel as cover, and as luck would have it, a boomerang shape emerged that worked well and added another Australian touch as did the Southern Cross. The body ash and the headstock rosewood and maple were finished with a lot of sanding and several coats of Danish oil.